As I mentioned in our very first post here on Living a Whole Life, one of the reasons I was inspired to start studying holistic nutrition was the fact that three friends of mine have undergone breast cancer treatment in the past year. When I started looking into what role diet plays in the development and treatment of cancer, I somehow ended up looking up the nutritional value of all kinds of different vegetables. I always knew veggies were good for me, but studying each of them individually gave me a new perspective on how important they really are to maintaining good health and fighting disease. So, in order to further educate myself and our readers, I have decided to profile one vegetable every month. I hope you will enjoy this regular feature and gain a new appreciation for your produce! Broccoli is a member of the cabbage family and is closely related to cauliflower. Broccoli is a highly nutritious vegetable that provides a wide range of tastes and textures. It contains significant amounts of vitamins C, K, A , Folate, and dietary fiber, among other vitamins and nutrients. 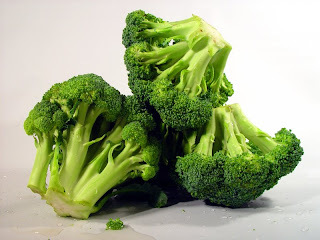 Broccoli contains the phytonutrients sulforaphane and the indoles, which have significant anti-cancer effects. A previous post I wrote on eating Raw discusses phytonutrients and why it is important not to overcook your vegetables. Broccoli is a crucifer vegetable like kale, cabbage and cauliflower. It has been shown that a diet high in these types of vegetables are associated with lower incidence of certain cancers, including lung, colon, breast and ovarian cancer. Bladder cancer can also now be added to this list. Studies have also shown that men consuming at least one serving of cruciferous vegetables a week reduced the risk of stage III and IV prostate cancer. According to a study published in Cancer Research the cancer-fighting capabilities of broccoli are even more successful against prostate cancer when consumed along with tomatoes. "When tomatoes and broccoli are eaten together, we see an additive effect. We think it's because different bioactive compounds in each food work on different anti-cancer pathways," said John Erdman, Profesor of Food Science and Human Nutrition at the University of Illinois. Broccoli is also known to support stomach health, provide help for sun-damaged skin, help to reduce heart disease, help to prevent cataracts, build stronger bones, boost your immune system, and fight birth defects. It is recommended that if cooking broccoli, you quickly steam or saute it as overcooking can dramatically impact the amount of nutrients you will get from your vegetables. Try not to microwave broccoli as it will significantly decrease the levels of all its health promoting compounds. Use Extra Virgin Olive Oil or Sunflower Oil to saute in order to preserve the vitamins and minerals. If broccoli is not your favorite veggie to eat, try adding it to your green juice! We love broccoli and eat it at least four times per week... usually lightly steamed and added to salad. Since you're interested in the link between nutrition and cancer, I take it you've read The China Study? I really recommend it if you haven't! I have read The China Study. It is one of the books that inspired me to study nutrition! Broccoli ROCKS!!! I bow down to broccoli! I have it multiple times a week in the form of smoothies, Plant Blood (green juice), Raw sides and snacks, as well as having it lightly steamed. YUM YUM YUM!!!! !